The popular revolt in Tunisia has inspired the largest protests "in the recent history of Yemen", the editor-in-chief of the Yemen Post newspaper, Hakim Almasmari, says. Yemenis were not prepared anymore to put up with widespread poverty while "corruption is everywhere", Mr Almasmari told the BBC World Service. "They are saying: 'Enough is enough, we want justice, and those who are corrupt should be taken to court'." 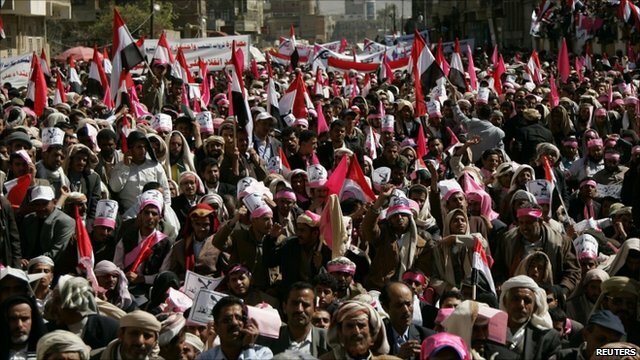 Thousand of Yemenis have been demonstrating in the capital Sanaa, calling on Ali Abdullah Saleh, president for 30 years, to step down. Mr Almasmari said the opposition had decided to initiate protests against the president because "they felt that all chances of a dialogue with the ruling party are vanishing".